I have a couple of comparison swatches for you today. 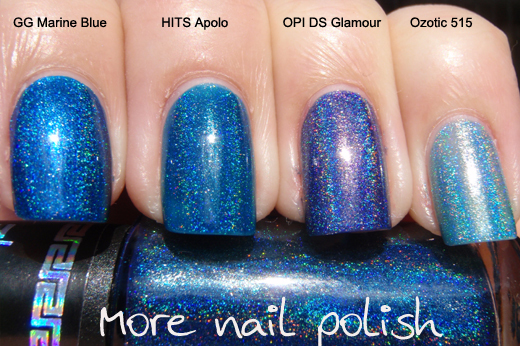 First up is some comparisions of blue holos. 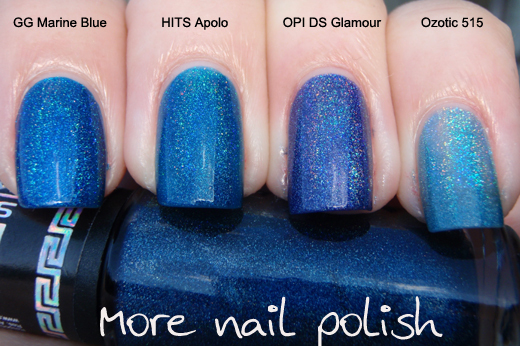 I really thought that Apolo was going to be identical to Glitter Gal Marine Blue, but while they are similar, they are not exact dupes (sweet - I get to keep them both!!). These photos are labelled, so you can see which is which. GG Marine Blue is much more opaque, it only need two coats. Apolo needs three. 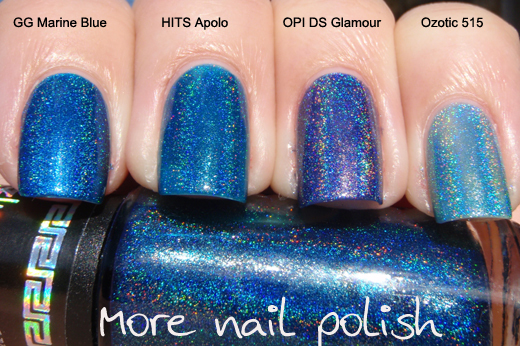 Marine Blue also has more of a metallic sheen to it as well as the holo rainbow. OPI DS Glamour (one of my all time favourite polishes) is a redder blue, and looks much more purple against Apolo and Marine Blue which are leaning green. I threw in Ozotic 515, as it's meant to be the dark blue, but it looks so pale in comparison here. The next photo in outside in the shade. I though it might help show the colour difference between Marine Blue and Apolo. OK, now onto the red holo comparison. 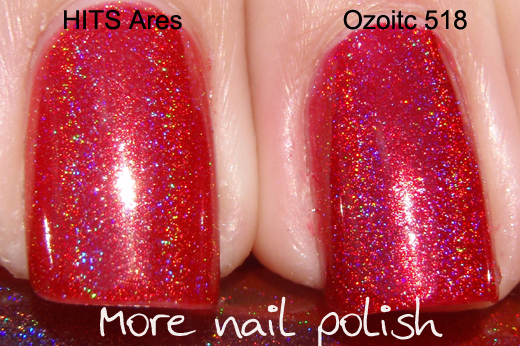 I only have Ozotic 518 to compare Ares with, but I have heard that GG Red is a dupe of 518. When I first wore Ares, I though it was a different red to Ozotic 518, and it is, but the difference this time is much more subtle. 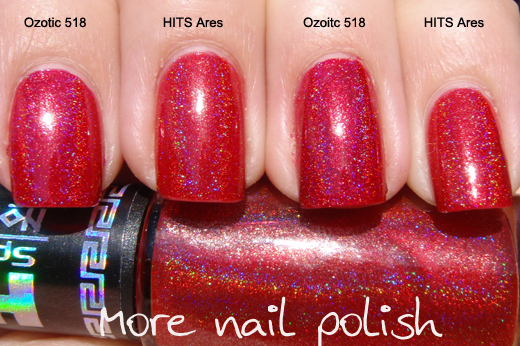 I actually still believe Ares is a truer red holo, whereas Ozotic 518 leans pink. In this close up you can see how the metallic sheen on each of these polishes is different. I swatched a few HITS today cause the sun was out and I wanted to do some more comparisons. OMG, I can tell you there are some absolutely spectacular polishes in this bunch. I'm so in love with these I'm seriously considering getting backups!! Zeus OMG, Dionisio double OMG!! Thanks for the great swatches and comparisons! I was lemming Ozotic 518 big time, but the Ares polishes might make them go away. Can't wait to see you swatch the other colors. Please do Hefesto next! Am so excited to get these! So pretty! And I agree with Loli, do Hefesto next post, I think you will love it. How do I get my hands on this collection?? great comparison!And great pictures as usual! Wow ... loved this comparison! It would've been cool to see your frankens next to these as well. I'm wondering how using metallic nail polishes in spectrafrankens compare to using creme nail polishes? Wow, I'm really digging these HITS polishes, thanks for all the swatches!